Most of Australia's biggest basketball stars have committed to chase gold at next year's World Cup - but the elephant in the room is the one name missing from the list. It has been revealed the likes of Patty Mills, Joe Ingles, Dante Exum, Aron Baynes and Matthew Dellavedova are all determined to suit up for the Boomers as they hunt their first senior international medal in China next August. However, Australia's brightest star, Ben Simmons, is yet to commit. 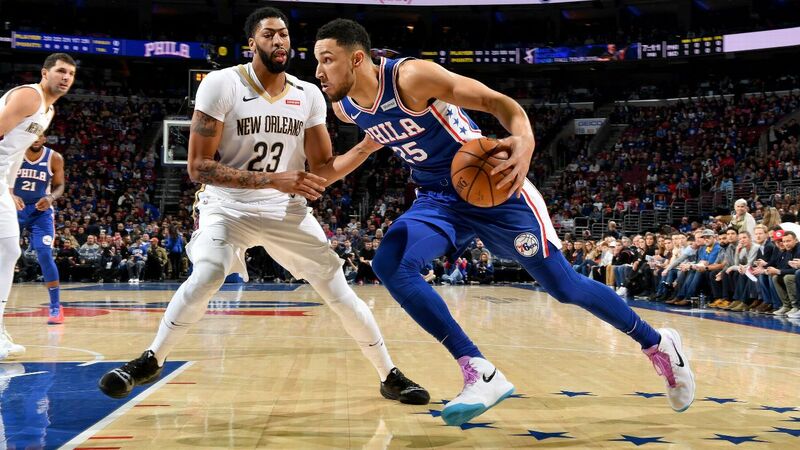 The Daily Telegraph reports last year's NBA Rookie of the Year -- who is eligible for a five-year maximum contract extension with the Philadelphia 76ers worth up to $223m in July -- is unable to commit due to discussions about his next mega-deal. Boomers coach Andrej Lemanis confirmed it was "less likely" Simmons would don the green and gold at the World Cup despite his passion for Australian basketball. "Ben wants to play for the Boomers but in terms of the World Cup he has a pretty important off-season coming up in the NBA," Lemanis told The Daily Telegraph. "He needs to navigate himself through all of that before he can confirm his availability. "I would suggest the World Cup is less likely but that is a question for Ben. "But he has indicated he is really positive about the national team and we've got the door open for him when he is ready to walk through it. "We'd welcome Ben with open arms." Currently there are 10 Australians in the NBA this season, fuelling hopes of that elusive maiden medal for the Boomers in China. They have narrowly missed out several times, including fourth-place finishes at the 2016 Rio Olympics, as well as the 2000, 1996 and 1988 Games. The Aussies qualified for the World Cup last week after smashing Iran 76-47 in Melbourne, in a rematch of the 2017 Asia Cup final, and Lemanis said his squad had mighty ambitions heading into China next year. "They are all committed to not only winning a medal but winning a gold medal," Lemanis said. "We had a meeting before the last qualification window in July and everyone indicated if they were healthy and had nothing going on at their NBA clubs that they'd participate in the World Cup. "Ben (Simmons) wasn't a part of that meeting but everyone else was and we had a good commitment from the group. "That is the focus and that is what they want to do. "They are all really proud of Australian basketball and they want to show the rest of the world what we can do. "You can really feel that sense of pride and wanting to achieve something special in the group." Lemanis paid tribute to the Australian-based players who helped the Boomers qualify for the World Cup and also hinted Sydney Kings star Andrew Bogut was a chance to make the cut. "If Andrew is healthy and continues to play at the level he is playing at, he can make a significant contribution for sure," he said. Has Exum turned a corner for the Jazz? Nick Metallinos speaks from Utah Jazz's victory against the Nets about the return of Dante Exum and how Joe Ingles has been inspiring the Jazz locker room. Ben Simmons records 19 points and 12 rebounds while JJ Redick scores a game-high 24 points in the 76ers' victory.